Judgment Day, according to those who were convinced the world would come to an end around 6PM this past Saturday, is when believers “…expect to be absorbed into heaven in a process known as the rapture” (“Make My Bed? But You Say the World’s Ending,” NYT, 5/19/11). A different kind of Judgment Day will occur when the jury hands down a verdict in the Dominique Strauss-Kahn case. In the first case, judgment leads to the Gates of St. Peter. In the second, it will in all likelihood lead to the gates of prison. Perhaps the roots of Strauss-Kahn’s epic downfall lie in the I.M.F. 's personnel policies, which the Times excerpted in a separate piece: “‘Intimate personal relationships, between supervisors and subordinates, do not, in themselves, constitute harassment’” (“At I.M.F., Men on Prowl and Women on Guard,” NYT, 5/19/11). Was this credo by any chance lifted from the Marquis de Sade’s 120 Days of Sodom ? The word subordinate would send a frisson of pleasure down the spine of any member of the Eulenspiegel Society. 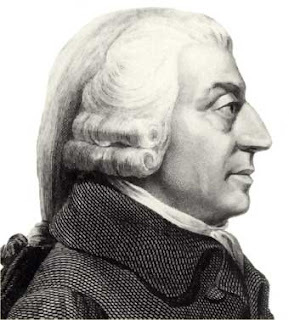 Here is the first line of Adam Smith’s Theory of Moral Sentiments : “How selfish soever man may be supposed, there are evidently some principles in his nature, which interest him in the fortunes of others, and render their happiness necessary to him, though he derives nothing from it, except the pleasure of seeing it.” The I.M.F., “the lender of last resort for governments that need money,” is an organization that employs many economists. Perhaps they would do well to go back to the author of The Wealth of Nations in proposing guidelines for how members of their little society, a microcosm of the world they purport to help, should comport themselves.